In August 2017, the Harvard T.H. Chan School of Public Health hosted a seminar featuring Beena Varghese, Senior Health Economist at the Public Health Foundation of India. Dr. Varghese presented findings from a study she led in Rajasthan, India to examine the impact of an adapted version of the World Health Organization Safe Childbirth Checklist (SCC) on rates of stillbirth and very early neonatal deaths. Partly due to the Janani Suraksha Yojana program that incentivizes women to give birth in public hospitals, India has over the past decade experienced a dramatic rise in facility-based delivery. However, because of health system inadequacies, this trend has not been accompanied by the expected level of reductions in maternal and newborn health outcomes. 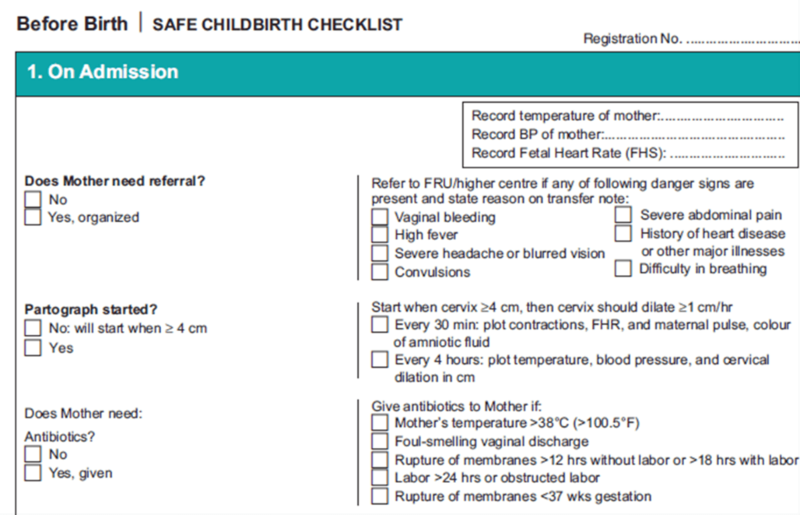 With the goal of preventing perinatal mortality and morbidity once women arrive at facilities for delivery, the government of Rajasthan partnered with Jhpiego to adapt the SCC to serve not only as a reminder tool but also as a job aid, adding simple instructions for health care workers along with the checklist (see an example below). The intervention was implemented in six districts of Rajasthan and incorporated a provider orientation session, monthly supportive supervision visits and mobile data collection. Another key aspect of the program was ensuring that birthing facilities would have essential drugs and supplies. To evaluate the intervention, Dr. Varghese and the research team recruited four comparison districts with similar demographic profiles and health system capacity including adequate human resources and infrastructure. In an effort to isolate the effects of the adapted checklist, the research team also ensured that facilities in the comparison districts had essential drugs and supplies. Districts that received the intervention saw an 11% reduction in facility-based stillbirths and very early neonatal deaths. According to Dr. Varghese, if this program, which seems to be highly cost-effective, were scaled up across India, about 40,000 stillbirths and very early neonatal deaths could be averted annually. “Stillbirth is often considered a woman’s problem—not a system or provider problem,” she suggested, which has led to a lack of investigation into stillbirths. Because of this lack of investigation many of the very early neonatal deaths are often categorized incorrectly as stillbirths in medical records, so the estimates of very early neonatal death rates in India are probably very low. Finally, Dr. Varghese reminded the audience that the SCC cannot be successfully implemented at facilities without the necessary resources and capacity. Health system-level gaps need to be addressed in order to end preventable stillbirths and maternal and newborn deaths. Watch a video of a recent webinar hosted by the Maternal Health Task Force and Ariadne Labs for another example of how the SCC can be adapted to local contexts.